I don't use any other mods, I think it has something to do with the Tundra in Warpack but I really don't know. I ran the game without Warpack to see if it was the game doing it and it didn't happen at all during 6 hours of play. Than I ran Game with Warpack on and it happened again after an hour or so. I tried clearing the cache and it didn't help. Maybe the next update from Wargaming will fix it for me. I just wanted to let you guys know. what game version on this server? So I don't have the glass or mirror images anymore. Did you guys update or fix something with WarPack? Or was it the last game update that fixed it? Either way I'm very happy that it doesn't happen anymore. Can't get Warpack to load using the launcher, have everything set up correctly and have never had this problem before. What should I do? Everything starts as normal but it wont load, it just says please wait, authorizing on the launcher. I've attached 2 screen shots. Change the server in the warpack launcher. The server I play on is down for maintenance right now, maybe that has something to do with it. It let me onto the server though, very strange. Thank you for the quick response and your help, I will keep you updated on what happens when the server is back up. Ok I got it to load, it worked for me with SRV2 checked, Thank you! Its not working on sea server atm. 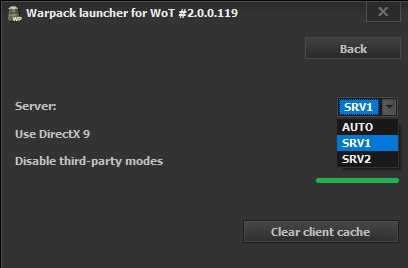 Change the server 2 in the warpack launcher.